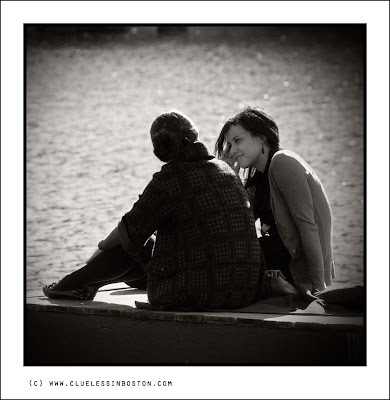 Two young women sitting on the dock at the Duck Pond in the Public Garden on a warm day last week. I would agree with magiceye. The light in this image is so fine. Certainly a friend heart is always a refuge in times of doubt and the right word to soothe the soul. And it's perfect in B&W! A warm photo for a cool day. Very nice. A wonderfully lightened and vignetted photo. You took the right instant to make this shot regarding the expression on the young woman's face. She asked, "Did you really get an "A" for that paper you copied from the Internet." Her friend responded, "Yes, but I didn't copy it from the Internet, I used the one you wrote last semester!" Great candid shot - the lighting is superb. This photo is so full of pathos... bellissima!